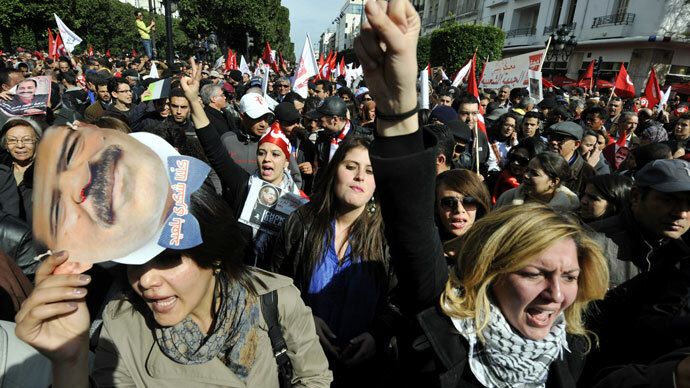 Thousands of supporters of the late Tunisian opposition leader Mohammed Brahmi accompanied his coffin through Tunis ahead of his burial. Meanwhile, police fired tear gas at activists outside parliament, demanding the disbandment of the government. Opposition leader Brahimi was murdered by gunmen on Thursday triggering protests and accusations of government complicity. 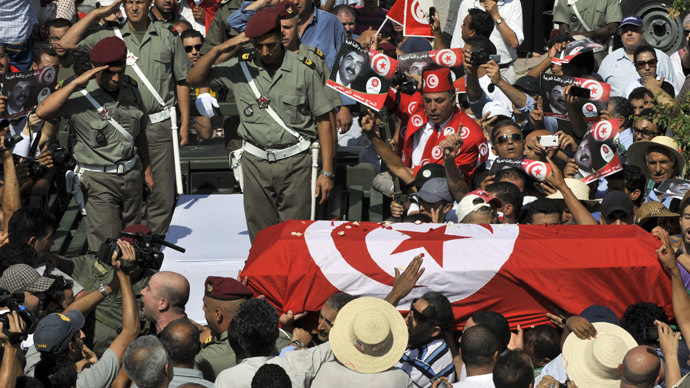 The former leader of the small left-wing party, the Popular Movement, was carried through the neighborhood of Ariana in a coffin wrapped in the Tunisian flag. 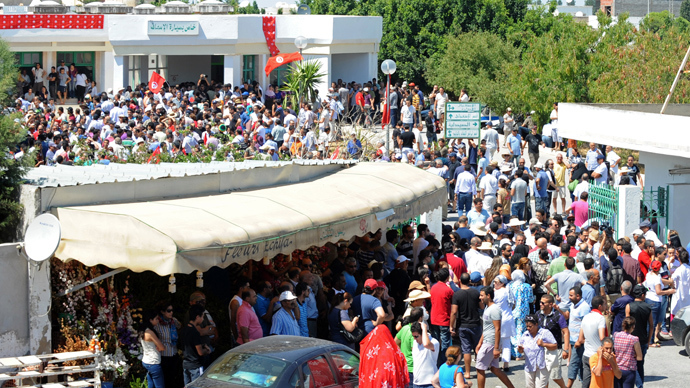 The cortege drew a crowd of thousands of supporters on its way to the El-Jellaz cemetery in the Tunisian capital. Mourners cried out for the Islamist-led government to be toppled as many see it as complicit in Brahmi’s murder. "The people want to topple the regime!" and "With our blood and with our souls we will sacrifice ourselves for the martyr!" people in the crowd shouted. "Ghannouchi, assassin, criminal," others chanted, referring to Rached Ghannouchi, leader of the ruling Islamist Ennahda party that Brahmi's family says was behind the killing. The procession was flanked by hundreds of troops and police, while helicopters circled overhead. After the funeral, clashes erupted between protesters and supporters of Ennahda outside Tunisia's National Constituent Assembly as security forces fired tear gas to disperse protesters, Al Arabiya reported. Police also fired tear gas in front of the parliament building, witnesses told Reuters. Protesters gathered there demanding the dissolution of the assembly while a rival rally of hundreds of Islamists defended the legitimacy of their rule and condemned what they called an attempted coup against democracy. The sit-in secularists' protest continued well into the night. The 58-year-old politician was gunned down outside his home on Thursday by two men on a motorcycle. Tunisia’s interior minister said that he was murdered with the same gun that was used to assassinate left-wing politician Chokri Belaid in February. Brahmi’s murder provoked the ire of secularists who took to the streets in mass protests, calling for the Islamist-led government to step down. 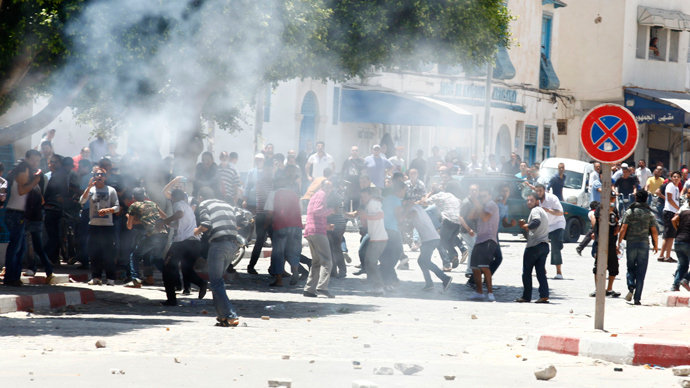 One protester was killed in clashes with police on Friday in the city of Gafsa. The ruling Ennahda party has denied any involvement in the killing and has laid the blame at the feet of hardline Islamist Boubacar Hakim, who is wanted for supposedly smuggling weapons from Libya. 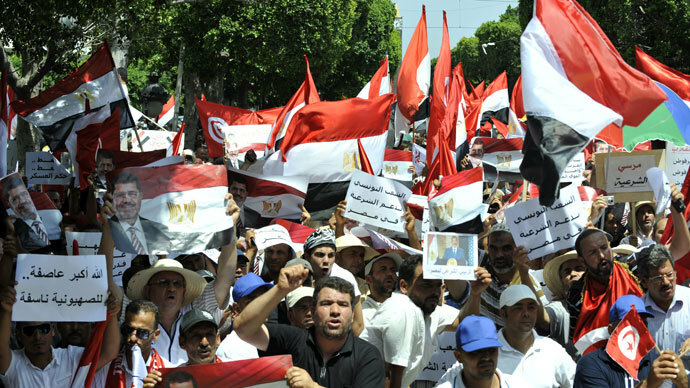 Although the Arab Spring originated in Tunisia with the toppling of President Ben Ali in 2011, the government has been unable to achieve stability. 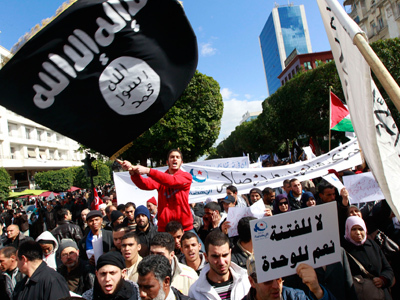 Secularists criticize Islamist groups such as the Muslim Brotherhood, which have a presence in the government, of hijacking the quest for democracy.